Ooh, Look - Craft: What day is it again? I like to think of myself as being intermittently creative. That is, occasionally, I’ll come up with something artistic and go “ooh, that’s nice”. But those days can be pretty far between, which is why my craftiness is only a hobby. Lin Mei, on the other hand, does it for a living. 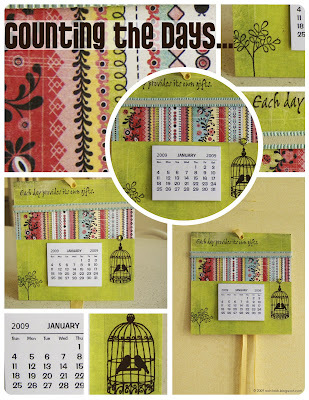 Which is why her input was greatly appreciated in the creation of this lovely calendar. LM came up with the design, as well as a great example for me to, um, rip off. It’s not that easy, though, as we found out on that hot day in a non-air-conditioned house. It took us about 3 hours to come up with the ‘right’ colour combinations – we finished the calendar just as the cool southerly change blew through. Here is the end result. The patterned papers are Basic Grey (Urban Prairie range), the bird cage transparency is by Hambly, and the ribbon and stamps are by Stampin’ Up!. Not too shabby, just shabby chic. PS: We had lunch first at the Zumbo chocolate café (ham and cheese brioche, nice) and were going to go back for dessert after the marathon craft session. But, dammit, the café closes at 4pm on weekdays! Denied!